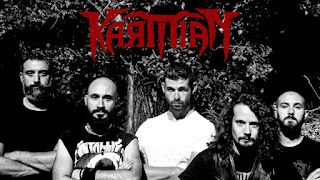 Karmian Releases Debut Album "Surgere et Cadere"
Italian melodic death metal band Karmian have released their debut album "Surgere et Cadere". The album was recorded at "ZetaFactory Studio" and "Dysfunction Studio". Recorded, mixed, engineered by Giuseppe Bassi of "Dysfunction Productions" and mastered by Giuseppe Bassi. Check out their new album here: https://karmian.bandcamp.com/album/surgere-et-cadere. Karmian was formed in 2005 under the name of "When the Storm Broke" at Modena, Italy. The first songs are written, but many line-up changes make the band split up in 2009, after a demo. In 2011 the founding members Andrea Baraldi, Mauro Leone and Nicholas Badiali asked Andrea Bertolazzi, former Bad To The Bone Singer, to join the band. The four restart the project under the name Karmian. In 2012 the band released their debut EP «Ways of Death» and after the band start touring Italy and Europe.